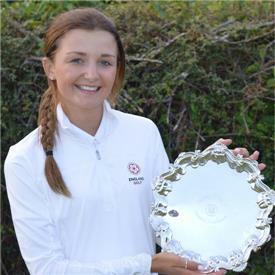 England’s Sophie Lamb won the British women’s stroke play championship by two shots at Knock Golf Club, Belfast, today – and, at one-under for 72 holes, was the only player in the field to beat par. But her mum, Carina, had to wait for the news that her daughter had won her first major championship – she was on a plane to Spain. “We’ll have to ring her when she lands!” added Lamb. The teenager moved steadily through the field after a first round of four-over 77, which left her six shots off the pace. “I struggled a bit off the tee and you can’t do that on this course,” she said. She came straight back with five-under 68 – six birdies and just one bogey – to put herself firmly in contention and two shots off the lead. Lamb played solid golf in this morning’s third round, returning one-under 72, but remained two shots behind the leader, 14-year-old Alessia Nobilio of Italy. In this afternoon’s fourth round Nobilio fell away while Lamb kept up her steady progress to the title, despite the challenge of Chloe Williams of Wales who closed with three-under 70 to finish runner-up, two shots back. “I had nine straight pars to start, then a bogey and a double, but I had some birdies coming in,” said Lamb, who signed off with one-over 74. Lamb has been challenging for a big win all season, having been leading qualifier in the English women’s match play championship, tied fourth in the English women’s amateur and sixth in the English stroke play. She also helped England win the Women’s Home Internationals last month. England’s Georgia Price (Bude & North Cornwall) tied third in the championship, following up on her second place in the English women’s strokeplay. Curtis Cup player Rochelle Morris (Woodsome Hall), English girls’ champion Cloe Frankish (Chart Hills) and international Inci Mehmet (Royal Mid Surrey) were in a group tied eighth.